If an application requires more than just simple strings in a ListView, the next easiest configuration to use is a Custom Adapter. Usually, the data to display will come from list of objects which are part of model, representing the data structure. 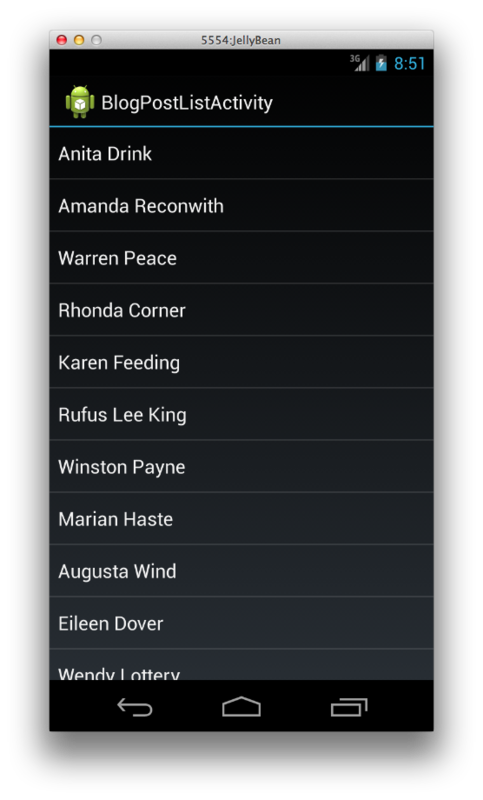 When the app runs, the People class will be used to create an object for each of the rows that will be displayed. Android will manage the scrolling as it did with the Array Adapter, but this time we'll need to create an adapter that will hand off the information from the data objects when requested. Android will take care of getting them to the right place at the right time as the user scrolls up and down. Our adapter class will inherit from the BaseAdapter and use a generic type <People> since that is the type of objects that will be displayed. To function correctly, our adapter will have to override 3 key methods so that Android will have the information it needs at the proper time. Count - Return the total number of objects in the list. 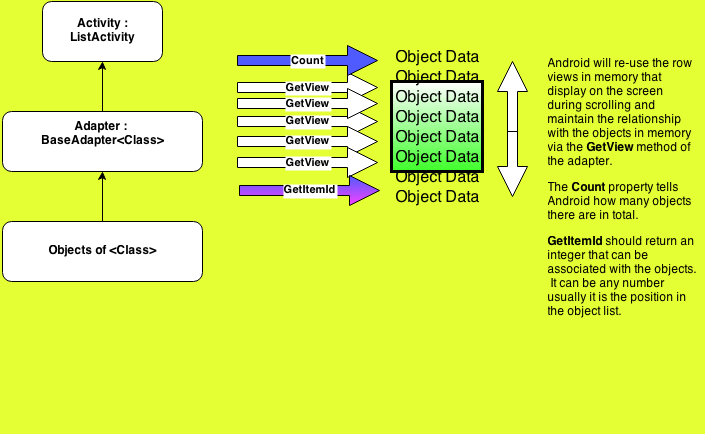 GetView - Android will pass the adapter a sequence number that it needs and this method will return a view that is populated with the particular object data that coincides with that sequence in the list of objects. GetItemId - Android will again pass the adapter a sequence number and this method can return an identifier which corresponds to that particular object. Usually this is just the same number as the sequence in the list of objects. When the GetView method is called by Android, it will pass the location in memory of the View it needs your method to populate. As the user scrolls down the screen, new rows will appear and your method will be called to populate them with the corresponding data. In reality, Android is actually reusing the same memory locations over and over to save memory as the list scrolls. This makes little difference to your GetView method since it will be building its view wherever Android requests it to, but occasionally it will be passed a null location if this is the first time that that particular row is being populated. The method will have to test for this condition using an "if", and if it is null, "inflate" a new view in memory before populating it. // for simplicity, this example will just populate a list of People objects from a hard coded method when it is first created. // ListActivities have built in listviews that fill the whole screen. The ListActivity is as follows. Changing the adapter to use the TwoLineListItem style produces the following. The SimpleListItem1 Style shown in the blog post on the ArrayAdapter can also be used, but it will only support the first text item. There is also an ActivityListItem style which includes an image that will be covered in a later post. Filtering and sorting can be performed by a CustomAdapter before it is displayed. 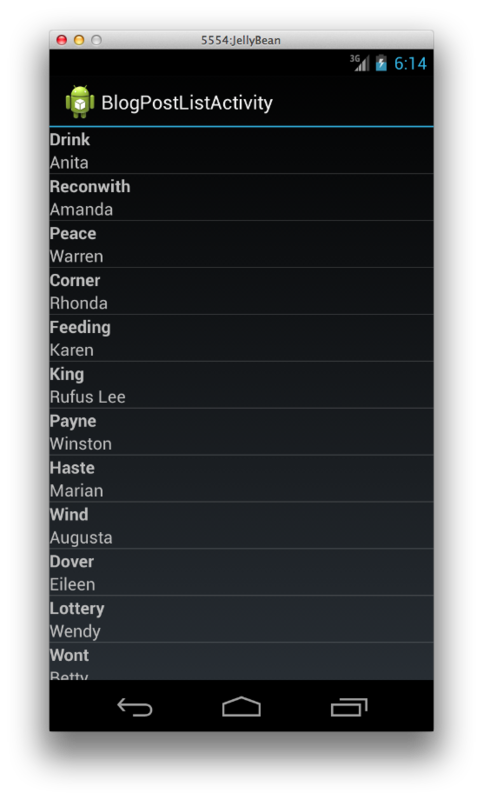 For example, modifying the PeopleAdapter to use a linq expression to sort on last name will re-order the data. Lists of repeating items are fundamental to almost any computer application and date back to the earliest days of programming. It's difficult to think of an application that won't require them at some point, so it's usually one of the first things to tackle when learning to develop for any new operating system. 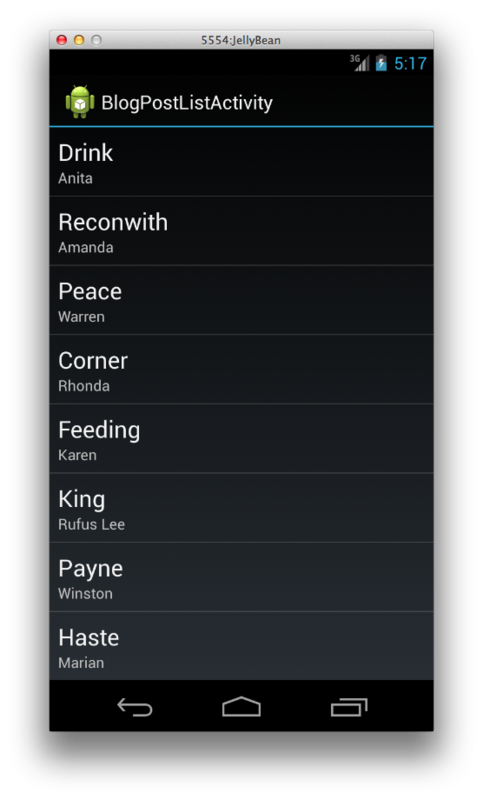 In Android, a list of scrollable rows is called a ListView. To function, the ListView needs a ListAdapter which is a class that will format a view for each row from the desired data when called for by the activity which is controlling the ListView. 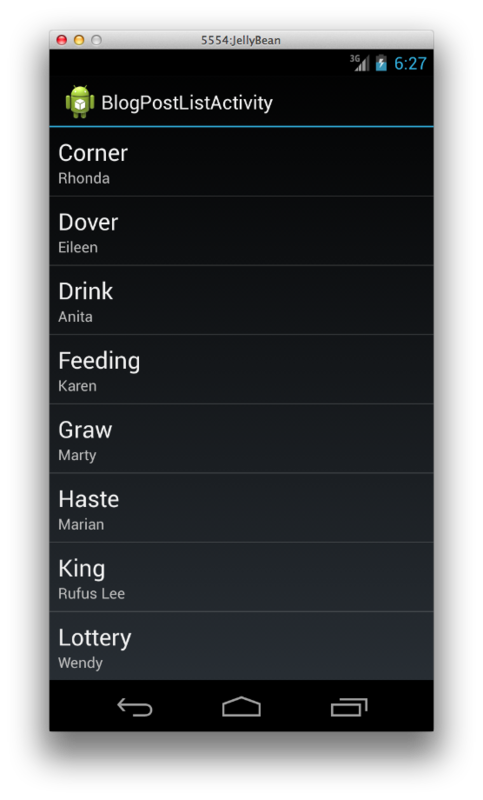 The simplest approach to display a list of items is to use the built-in ListActivity class. It will already contain a ListView which fills the entire screen, and a ListAdapter to bind the data. No AXML layout is required to define the screen layout. Using an ArrayAdapter is all that is necessary to get simple data onto the screen. Nothing further is need to display the array data.